And we’re getting ready to publish the 5th edition! 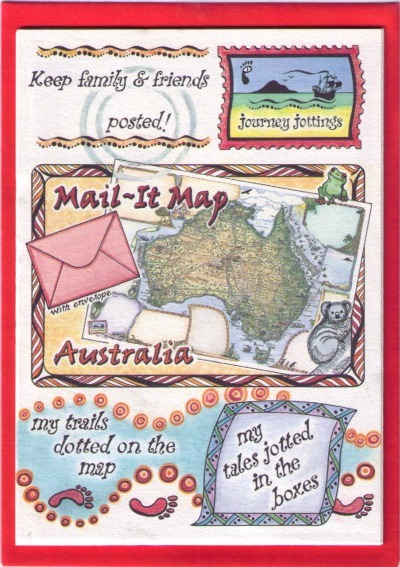 Mail-It Maps keep family and friends posted with where you are on the map, and what you’ve been doing in the boxes around the outside ~ Its more than a post card, but less laborious than a letter! 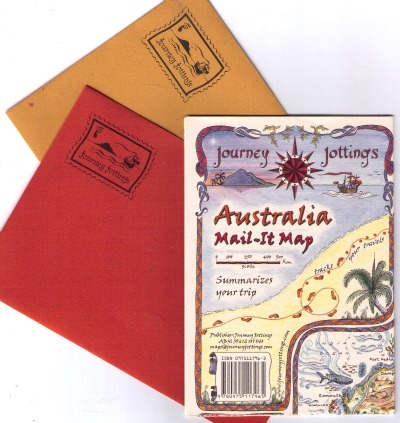 We printed the first edition on a cream coloured paper, which went out with gorgeous rusty red and ochre coloured envelopes that had speckled flecks in it. 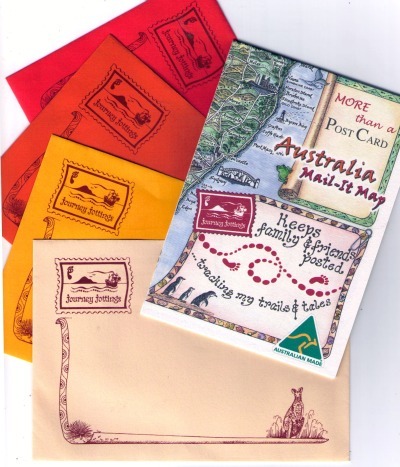 I loved those envelopes – They conveyed the rustic Australian landscape and were 100% recycled. So when we came to publish the second edition, we had to look elsewhere. Now you’d think getting some earthy coloured, recycled envelopes would be a cinch … Think again. The image above, is the revamped version but the immediate response was that it was too busy! Then the printer had a problem with his press, resulting in them all having to be re-done. 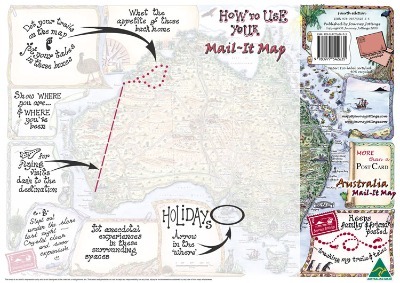 Wishing to oblige, for the 4th edition, we reduced the 8 colours back down to just four, keeping them more reflective of the Australian landscape. 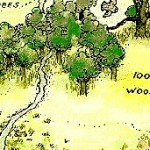 And I also put a different section of the map on the cover. So… where will the 5th edition go? What would *YOU* like to see? This entry was posted in NEWS and tagged Journey_Jottings_News, mail_it_map by Linda. Bookmark the permalink. Wow, what an achievement Linda, that’s fantastic!! But am looking at a bit more of an enviro envelope for this next printing. Fantastic story Linda! Congratulations and best of luck with the 5th edition. Its exciting to think we’re about to put out a 5th edition!! Wow! 100,000 sold. Fantastic! 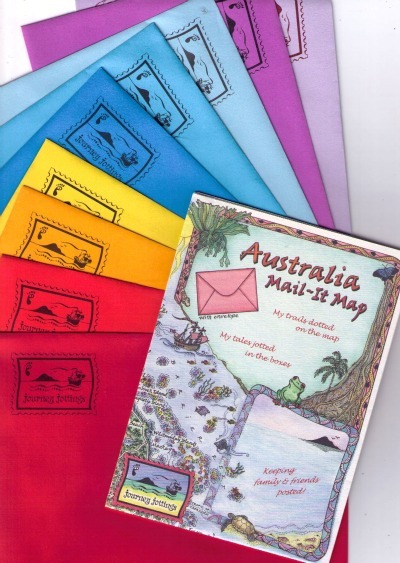 I also loved those first colours of the envelopes with the recycled paper. But the new ones look good too. Quite a creative journey in itself, getting to that point! The revised explanation on the front is excellent – tells it all in a nutshell. Brilliant! I’ll put up a post as soon as I can get some images!